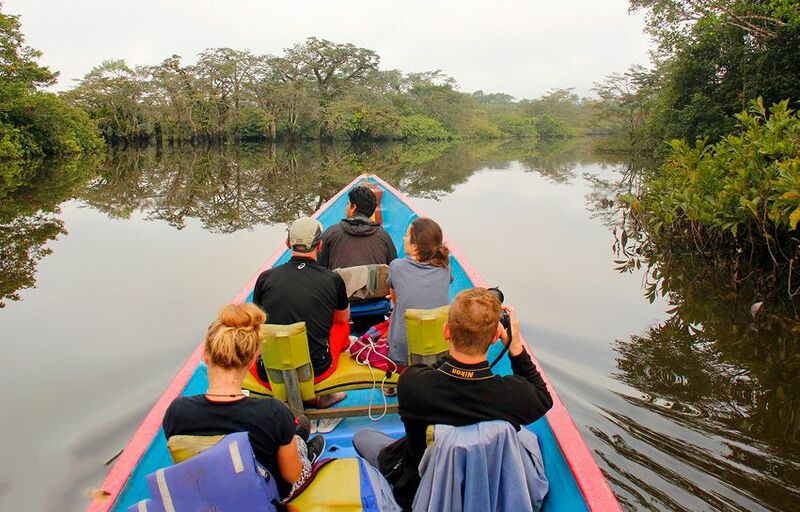 As our cigar-shaped motorboat puttered down the sediment-rich Cuyabeno River, iridescent blue morpho butterflies flashed overhead, toucans called from the treetops, and river dolphins swam beneath us. We were spellbound. “Can this be real?” I thought. Though it was hard to spot all the birds, monkeys, lizards, and tree sloths that our eagle-eyed guide pointed out among the dense foliage, “I found myself mesmerized by the infinitely varied sizes, shapes, textures, and colors of the tropical plants passing before my eyes.” The following days piled adventure upon adventure: a sunrise bird-watching expedition, a nighttime caiman hunt, and a muddy jungle hike on which we saw brilliant poison arrow frogs and even a 3-foot-long earthworm. On our final excursion, we hiked to a Siona Indian village, where in a sudden downpour we grabbed giant banana leaves to use as umbrellas. We met a local woman who skillfully wielded a machete to unearth a bulbous yucca root, which was used to make a tortilla-like bread cooked over hot stones. The village shaman then took us to a hut, reappearing minutes later wearing an emerald tunic, a bandolier of tawny nuts, necklaces of boar tusks and jaguar claws, and a “resplendent” feather headdress. He ingested none of the hallucinogenic herbs that help fuel longer rites, but he chanted a bit while striking me gently with a bundle of medicinal leaves. At Siona Lodge (sionalodge.com), all-inclusive four-day trips start at $380.